Have you ever heard that certain leafy greens need to be cooked before eating? Nutritional powerhouses like kale, collards, spinach, chard, and beet greens all contain oxalic acid. Oxalic acid occurs naturally in many fruits and vegetables, but when it comes to leafy greens, it's present in higher concentrations. The problem with oxalic acid is that it binds with calcium and other minerals (like magnesium and iron) in order to be excreted from the body. Calcium and magnesium are precious minerals our bodies need to function and grow properly. We are generally low or deficient in these minerals because modern-day agriculture practices have led to mineral-depleted soil. If we eat raw kale or other leafy greens raw, we just further the problem. However, you don't have to give up these delicious, dark green leaves completely. Oxalic acid is easily reduced by steaming, boiling, or wilting the leaves of any of these vegetables for 5 to 8 minutes. Gently squeeze out any remaining water from the vegetables, and continue on with your favorite recipes. Also, dump the leftover water, because oxalic acid leaches out of the leaves and into the surrounding liquid. 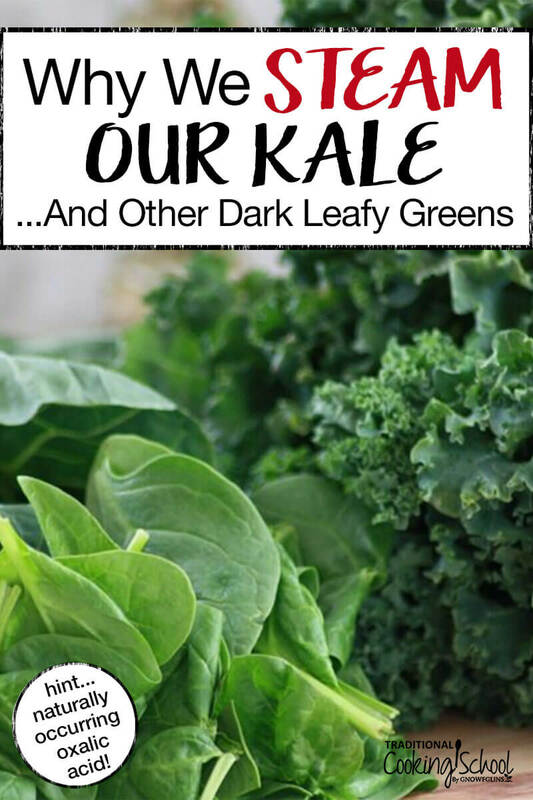 Here are a few of our favorite dark leafy green recipes. You can also ferment greens to reduce the oxalic acid, such as in this fermented lemon spinach kraut. Do you love your greens? How do you work around the oxalic acid issue? What's your favorite way to reduce before consuming dark leafy greens? Hey, great blog post! I was wondering, does dehydrating kale get rid of oxalic acid, or does it need to be cooked? Kristina, it needs to be cooked first. Great info! Up until last year I didn’t know much about this. My husband is especially prone to kidney stones and has to be very careful of dark greens. What about for juicing? Can you tell me how to work around this? Does this also pertain to lettuce? Do we have to cook all greens and how long can they be frozen? Lois, I have never juiced kale or any other green for that matter. But to reduce the oxalic acid, it would need to be cooked first. What about lettuce? I really want to continue juicing greens. . . so looking for a good solution. Lettuce would be perfectly fine to juice. 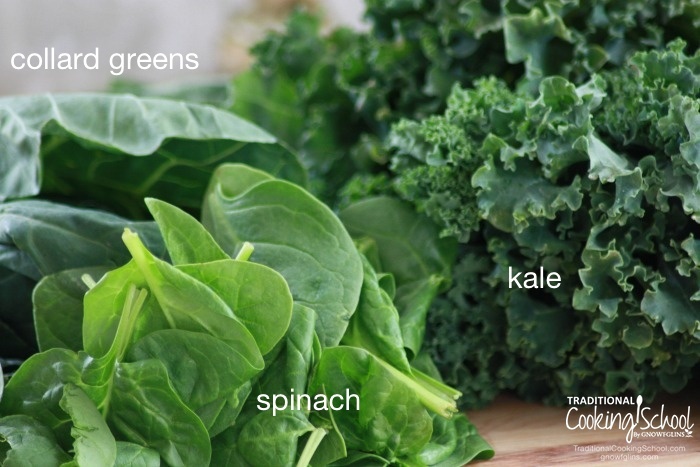 Do you know if oxalic acid or the goitrogenic effect of these greens is reduced when baked or roasted, such as with kale chips? Thanks! Lindsey, while not 100% positive (because I haven’t tested it in a lab) I would think that baking greens would reduce the oxalic acid. Assuming the temp is higher than 300 degrees Fahrenheit. I didn’t cook my kale but simply dehydrated it. I figure this still does some good in reducing the oxalic acid. What do you think? What temperature did you dehydrate the kale at? I tend to dehydrate all of my vegetables and fruits at temps 110 or lower. In this case the oxalic acid would still be intact. I don’t know but it was a food dehydrator so I think they are set fairly low. That is too bad; I was hoping it would make a difference with the oxalic acid piece. I wonder if this is why most kale chips taste like dirt to me. I will need to experiment. Now I make a kale salad by salting it and massaging olive oil into it. This wilts the leaves and makes them taste not like Kale. I’ve also done it to collard greens. I wonder if this reduces the oxalic acid. A massaged kale salad (or collards) would still contain the oxalic acid if not cooked. I *love* raw massaged kale salad, but I do limit myself to it only once or twice a year because of this very issue. My understanding is that oxalates are less a concern with kale and other crucifers than the goitrogens and how they can affect the thyroid. Other sources have suggested steam time of 3+ minutes for spinach and 4+ for kale. If you have a concern with those anti nutrients, you might need to steam them at least that long. We have no health issues; I steam my spinach 2 mins and kale 3 mins. Would wilting them directly in a frying pan rather than in a steamer basket work? Or is it a necessary step that water is drained off them? I like to cook them down in stir fries and soup but don’t separately steam first. Should I? Lynne, you want to drain the water. This is depressing. So all those fresh spinach salads I’ve been feeding my family for the past several weeks from my husband’s organic garden are bad for us? And the kale in the freezer that I want to just throw into soup will leach the bad stuff into the soup broth. Dang. What about baby kale? Probably contains less because it is smaller? It certainly is easier to chew raw when it’s still young! This is actually not true!!! If you are interested in a scientists take on these ‘problems’ with raw greens check out Foundmyfitness.com. If you are not a scientist or nutritionist you should not spread incorrect information!! I did research and found the original post that Victoria Boutenko sent out months ago which I had forgotten about. The problem is kidney stones. If you don’t have a family history or problem with them raw foodists (I found others) say NOT to worry. The benefits of raw out way the other. Also, rotate greens. I’m going to continue with my green smoothies and not worry about it. Just wanted to make sure I was doing the right thing. Would it be a good idea to use the water from steaming to water plants in the garden? Then why on earth do all the raw foodists tell you to eat RAW greens every day for the most benefits? Is oxalic acid that serious of a problem? Yes, I want to know this answer too. Thank you for your efforts and successes in changing the way Americans think about food. Okay, let me make sure I’m not confused. Fermenting aside, all dark leafy greens must be steamed only, if you wish to remove the oxalic acids? I have been making sauteed kale in my good ole cast iron skillet forever; I was under the impression that cooking them was all that was needed to neutralize oxalic acid. I saute in coconut oil, with perhaps just enough water to create a little steam and facilitate faster cooking. Are you saying I should steam them FIRST, throwing out the water below them, and THEN cook them my normal way? Thanks, Wardee. And also for the Kombucha/tannins answer. yes, what is the answer pls. I already have bone loss and now this scares me a lot! Also – slightly off topic, but the WAPF article link also mentions tannins in tea being anti-nutrients. When we use tea for Kombucha brewing, we aren’t draining off that water, so, do the tannins still remain? I use kale, chard, and spinach in smoothies, but to aid in reducing the amount of oxalic acid available to be absorbed by the body, I also add citric acid (from lemons or limes) and milk or almond milk (for additional calcium). Research has shown that both citric acid and calcium help to make the oxalic acid unavailable for uptake by the body, thus reducing the amount of oxalic acid absorbed. I steam vegetables from time to time and like the idea of it, but the water in the pot under the steaming basket turns green from leaching out the green vegetables. Is this removing nutrients from the greens? When I cook in water, I use minimal water and drink the water after cooking. I really love these greens in salads. Obviously, once cooked, they no longer work for salad greens. Any way around that? Anything you can do to counteract the effects of eating them raw? Which leafy greens are okay to eat raw? I read this article and the comments on the same day I made my first raw spinach containing smoothie ever. That’s such an incredible coincidence, it has to be a warning sign from the universe. I have enjoyed your many helps in cooking healthy, but this information about raw spinach has puzzled me completely. Below is an excerpt (page 63) from the book Fresh Vegetable and Fruit Juices by N.W. Walker D.Sc.known world wide. Please explain! – I am looking for referenced information, if at all possible, to help me understand why Dr. Norman Walker would not agree with cooking (steaming) spinach at all. Thank you so much! “..Live Food means that food which contains live organic atoms and enzymes found only in our raw foods. We have in previous chapters, covered this important question of organic versus inorganic atoms in our food. It is very vital to stress this matter in regard to oxalic acid. When the food is raw, whether whole or in the form of juice, every atom in such food is vital ORGANIC and is replete with enzymes. Therefore, the oxalic acid in our raw vegetables and their juices is organic, and as such is not only beneficial but essential for the physiological functions of the body. The oxalic acid in cooked and processed foods, however, is definitely dead, or INORGANIC, and as such is both pernicious and destructive. Oxalic acid readily combines with calcium. If these are both organic, the result is a beneficial constructive combination, as the former helps the digestive assimilation of the latter, at the same time stimulating the peristaltic functions of the body. When the oxalic acid has become INORGANIC by cooking or processing the foods that contain it, then this acid forms an interlocking compound with the calcium even combining with the calcium in other foods eaten during the same meal, destroying the nourishing value of both. This, results in such a serious deficiency of calcium that is has been known to cause decomposition of the bones. This is the reason I never eat cooked or canned spinach. Much depends on quantity of spinach and/or kale you consume, I think. My personal belief is that plant foods work synergistically and that the relatively small amount we use in our smoothies is likely not a concern for healthy people. Juicing, if using huge amounts of greens, may be another story (I don’t juice). Probably why juices contain other fruits and veggies along with greens. It’s a conundrum. You lose nutrition while getting rid of possible anti-nutrients. That’s why I apply the ideas of everything in moderation, and rotate your greens. Does culturing your vegetables take care of this problem? What does culturing do to the oxalates? Hi everyone, I know this thread has been going on for a while but I just discovered it. If anyone is interested (e.g. Laura and Ann may be judging by their last posts) fermenting raw kale does lower the oxalic acid, so you get the benefit of the raw “live” food while eliminating the problem of the oxalate. Relative to some other green leafy vegetables kale is quite low, but I eat loads of kale so this is a good way to do it! In case you don’t know how, you make it just like you would sauerkraut, just replacing cabbage with kale (although I mix both!!). Not only does steaming reduce the oxalic acid, it also INCREASES nutritional content in cooking/fermenting veggies. In order for our bodies to maximize the nutrition from food, we need to get ALL of it from cooked, NOT overcooked, foods. Does steaming reduce getting gas from Kale? My understanding is that oxalic acid in the urine reacting with calcium in the urine produces the very insoluble calcium oxalate in-situ, which can then end up as kidney stones. I would guess that if oxalic acid were to form the insoluble calcium oxalate BEFORE we ingest it, that then the insoluble calcium oxalate would not enter our blood or urine to begin with. Hence I throw my kale in a blender along with some calcium supplement pills, and then use it in vegetable soup that I cook for over an hour. My theory is that this will promote the reaction from oxalic acid to calcium oxalate before we eat it, making it safer. DISCLAIMER: I have a little background in chemistry, but none whatsoever in medicine or nutrition. That is a good idea, yet kale contains very little oxalic acid. Actually less than 10% than that of lettuce! Source :USDA food list : http://ndb.nal.usda.gov/ndb/search/list.